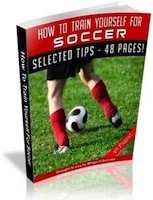 Discover The Secrets To Winning More Soccer Games In Less Than 5 Days" ...Scientists Discover the Secrets to Winning More Soccer Games INSIDE the Player Stomach! 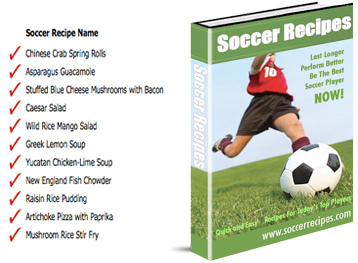 I am including 3 FREE Bonuses when you order Soccer Recipes! All of this is yours FREE when you order Soccer Recipes! How many times have you played and felt very sluggish in the second half? "You Can Score More Goals By Eating Soccer Food" and yes it really is true! And that's what Soccer Recipes is -- a no-nonsense soccer player's cookbook that's laser-focused on building strength, energy and stamina. Soccer Recipes is loaded with good tasting food that's good for you and especially formulated for the soccer player. That's because Soccer Recipes was written BY a soccer player FOR soccer players. Soccer Recipes is chock-full of good-tasting, eye-pleasing, good smellin' meals and high energy carb snacks that are so easy to make that you may never be tempted to eat anywhere but your own kitchen again!